Nothing sums up my feelings after leaving this film better than telling you I had an unsettled feeling in my stomach. I was very confused and began to ask why the film went in certain directions and why it attempted to explore certain topics in such a half-assed manner. The more I asked, the more confused I was. After seeing the trailer to Lakeview Terrace, I suspected a stink-bomb in the realm of Snakes On a Plane…and I got it. I’m not sure why Sammy L. would attach himself to this drivel other than the fact that the script may have looked better than the film turned out to be. Unfortunately, even he was not able to save this film from the sad direction it ended up going. At the heart of the story is Abel Turner (Samuel L.), a single father of two children who has trouble coping with the difficulties of his job as an LAPD cop, and raising his kids in a better environment than he had growing up. The problem here is that he is a full-fledged racist. When his new neighbors move next door, he shutters at the fact that they are an interracial couple. Because of the couple’s poor first impressions such as christening their pool with a little “synchronized swim”, and flicking cigarette butts onto the street, Abel turns into the neighbor from hell. He goes about messing with their property and generally not making them feel the least bit welcome. All this does is display a weak attempt to cover up his disdain for the interracial couple. Yet, the writers of the film make a horrible attempt to have the audience sympathize with Abel. We learn that he has lost his wife, and part of that occurrence explains why he hates the idea of interracial relationships, but at that point the damage is done. We already see him as an angry, bitter, racist a-hole and have trouble mustering up any feeling of sympathy for him. The extent to which he goes to make his neighbors’ lives hell makes him more of a certified psychopath than a distraught man with conflicted views. I couldn’t help but to ask if the goal of this film was to explore race in our current society, or just create a really bad premise for a thriller/suspense. If the latter is the case, I suggest you watch The ‘burbs (Tom Hanks circa 1989) instead for a more amusing and entertaining look at creepy neighbors. The film attempts to explore the potential problems with your psycho-neighbor being a police officer, but it completely misses there as well. There is no special circumstances that come about from his being on the side of the law other than a comment or two about him “knowing who is on duty”. Big whoop…they could have done so much more with it. This film was a complete failure on every level. On top of Abel Tuner’s problem with the interracial marriage, the woman’s father clearly has issues with it, and the couple makes a pathetic attempt at a heart-to-heart discussion regarding their “situation”. It’s as if it was written by someone who clearly objects to people from different races being a relationship. Anyone who is hopefully enlightened enough to accept people for who they are will have issues with this portrayal. 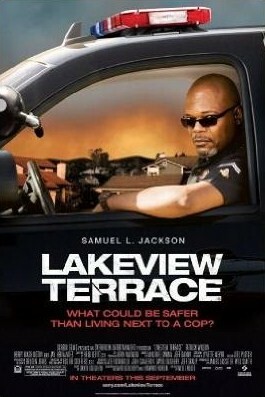 Lakeview Terrace contributes to current stereotypes rather than explore them and attempt to resolve anything. I hate seeing Sammy L. in this role and would have hoped for better judgment on his part. After all, at least Snakes On a Plane wasn’t offensive to its audience. Well, maybe just a little offensive. Interesting Cameo Appearance: Justin Chambers (aka Dr. Alex Karev from the chick-favorite Grey’s Anatomy) as Donnie Eaton, dinner guest and friend of the Mattson’s, who doesn’t take long to offend Abel Turner, their temperamental invitee. Abel Turner: You know you can listen to that crap all you want, and you’ll still be white.